▼ Lucky Grab Bags for sale! 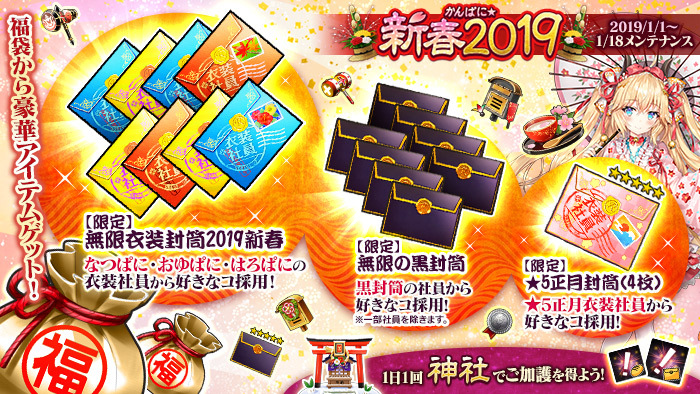 First Dream Lucky Grab Bag [Pine] features the [Limited] Infinite Costume Envelope New Year's 2019, which allows you to recruit any costume employee from the [Natsupani], [Oyupani], and [Haropani] events. 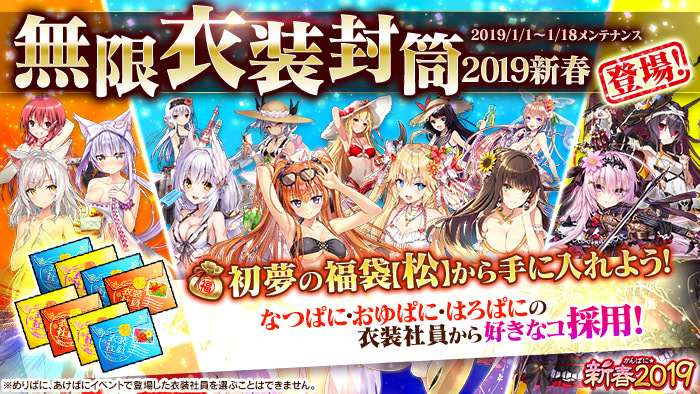 Furthermore, you will also receive the [Limited] Infinite Black Fairy Envelope, which allows you to choose any black envelope, as well as the [Limited] ★5 New Year's Envelope (4x) where you can pick your favourite ★5 New Year's Costume Employee! Other grab bags include one with recruitment items, grab bags that can be bought any number of times with Gold, and other many more. ※ Contains costume employees from Natsupani, Oyupani, and Haropani. Used to promote an employee to the next career level. Used to promote an employee to the next class level. Can be sold for 500 000 Gold. ▼ Participate in the [Shrine Visit] to sortie to a time limited quest! During this period, once a day (between 00:00 and 23:59), you can participate in the [Shrine Visit] on the special event page. After the [Shrine Visit], you will unlock one of the time limited quests [Partner Wish], [Experience Wish], [Gourmet Wish], or [Development Wish] or 15 minutes. Each quest drops specific items. Other equipment manufacturing related items. Last edited by Folseus; 01-02-2019 at 04:52 AM.